How far have you got with this problem? To be honest, I stopped reading the thread when it went off on a tangent, and the last time you mentioned the wheel wobble was 24 posts ago! You were going to return the tyres to Openeo weren't you? How did that go? The Oponeo thing was a separate issue to this thread entirely, having its own thread in the Rant and Rave section. But to answer your question i sent them back and got the refund ages ago, after fighting with Oponeo for a whole month due to their utter incompetency. In relation to this im now fighting yet another vendor as they are trying to work outside the rules of eBay's policies, even asking me for a copy of my drivers licence, and saying that they will test the tyres themselves and if their engineer deems them as ok they will take back my refund! Ive mentioned this to eBay and they will be investigating this vendor for fraud as this all goes against eBays policies for buyer protection. I shouldn't have to be jumping through all these hoops just to return a defective item! If you sell through eBay you have to play by their Terms Of Service, not try to work outside of them or make up your own so that you can strip your customers of all their rights and protections. So in the meantime im still no closer to a solution, other than having one more tyre garage with 45 years of experience have another look tomorrow, either way we'll know whats what by then. Ya never know, maybe third time's the charm? 24 posts huh, should maybe mention other people were involved in the conversations that happened since then, just sayin', sometimes things go off topic around here - happens quite a lot actually, this is the first time ive heard of it being a problem however. ? Arya2.0S wrote: this is the first time ive heard of it being a problem however. ? Fair enough, my bad as the youngsters say. Anyway, I hope you are able to resolve the issues you have been experiencing. Goodness me. I don't me any disrespect, but as I have said before, are you sure it isn't you and/or the way you are going about buying some stuff. It is just that you seem to be in disputes when buying items so often. How can it be the way im buying stuff? I have no contact with these vendors before i buy things from them, i click "buy it now" and thats it. You think im messaging them before i buy something and giving them a bunch of grief like a poorly behaved customer in a restaurant then giving them my money so they can spit in my food, so to speak? Same with the Oponeo people, all i did was buy tyres from their website, i didn't speak to anybody, had zero contact with any human beings (the reason i like shopping online), and it was only because they couldn't figure out a very simple task (how to pick up the tyres they had sent me) when i started having issues since they didnt know their asses from their elbows and refused to communicate properly, all whilst they were holding my money to ransom, same with these new people. Clearly thats all my fault. Anyway, im having eBay step in with these fraudsters as they are trying to do business off-site, asking me to fill in claim forms by email and asking for a copy of my drivers license!! - which is totally against eBays policies btw (guess i should have been "nicer" to the seller when i clicked that "buy it now button" huh? ) They will be investigating them soon and as far as i know investigating them for fraud based on what the customer service rep told me last night. Im also getting rid of these wheels and going back to my old 4-spokes as im sick of all the hassle and expenditure, just not worth it. Seriously, weeks of non stop aggro and anxiety, costly outlays, masses of effort and energy (great things to do when you have chronic fatigue syndrome) and depression brought on by the whole situation and im told its all my fault. Wow. Thanks for your reply. I was only asking But if you are conversing with your suppliers in a similar manner, then it won't help your cause, not at all, no matter who is at fault. Anyway, good luck with you disputes, hope you are sorted soon. pbar wrote: Thanks for your reply. I was only asking But if you are conversing with your suppliers in a similar manner, then it won't help your cause, not at all, no matter who is at fault. We're all supposed to not have any emotion when people screw us over and leave us £100's out of pocket that we cant afford, and we all deal with things equally and easily like the all coping, perfect neural typical's we are? Anyway, eBay has ruled in my favour so guess I was right all along. A refund will be forced my way regardless of what the shady business says or tries to do to weasel its way out of it, but i am still £75 out of pocket due to their defective shite and wont be getting that back, and i still have another unknown cost on top of that just to get the tyres removed from the wheels (one place quoted me £40 just to do that, even though the wheels are not on the car at this stage) which i also wont be getting back! But yeah, lets all be sunshine and flipping rainbows about it, and not get even slightly angry at people when they rip us off and force us to lose money, not to mention the emotional and physical price some of us have had to pay through all this. We wont make any considerations for that, as it clearly doesn't matter, only thing that matters is how THEY'VE been treated, as we must be prim and proper and perfect to people when we hand them £100's of our cash for products or services, and even more considerate when they break their contractual obligations and rules and regulations or when they provide us with sub-standard tat because hey, it's all our fault, not theirs. Still dont see how "being nice" to someone is a factor when buying something through a system that separates all human contact, or how that plays a part in your consumer and statutory rights but hey who cares about that, right? Nobody said be nice about it. Or nasty. There is a middle ground of just saying what you mean, as logically and unemotionally as possible. As you know, it takes it out of you to rise to it and usually won't get anything done any quicker. There is a balance and it is the region where logic and calmness manifest. Major_Tom wrote: Nobody said be nice about it. Or nasty. There is a middle ground of just saying what you mean, as logically and unemotionally as possible. As you know, it takes it out of you to rise to it and usually won't get anything done any quicker. There is a balance and it is the region where logic and calmness manifest. No i know, I'm just sick of victim blame culture. I haven't spoken out of tone with any of these people (apart from maybe during that Oponeo situation at one point but that was for good reason and only after they mucked me around for the 5th or 6th time), and i mean when eBay themselves are having to get involved and are possibly investigating these people for fraud based on my case (trying to work around eBays own rules and policies, emailing me off-site and demanding a copy of my drivers licence etc), not to mention the sheer hassle, financial outlay and stress of the whole situation, its a little maddening to even humour any notion that this could all be my "fault" based off how i might have just spoken to somebody at some point, you know? Regardless of how you speak to someone, when business is involved and 100's of pounds at stake it shouldn't bloody matter! The vendor has an obligation to supply you (by law i might add) with a satisfactory, fit for purpose product and if you receive an item that is anything less than that you have every right to a refund or replacement based on statutory rights alone! Thats the bottom line as far as im concerned. How ever you speak to or are spoken to during this process is a totally irrelevant and moot point as it has no bearing on consumer law or your rights as a customer. And like i said, how would that notion even apply when theres no human contact to begin with? I clicked "buy it now", i didnt speak to anyone at that stage, so how does that "being nice" logic even apply to that situation? What is the excuse at that stage for sending me a defective product after i forked over nearly £200? Not only that, but the tyres i received are also even possibly out of date as a tyre fitter with over 45 years of experience that i had take a look couldn't even identify a date stamp on tyres that should have been less than 12 months old according to the sellers ad! All tyres regardless of brand (and i was told this by the aforementioned professional) have date stamps on them, and it was a requirement post 2000 to put a date stamp on the tyres. So they are either over 17 year old NOS, or something is else is hooky. How is that my fault exactly? See where im coming from? 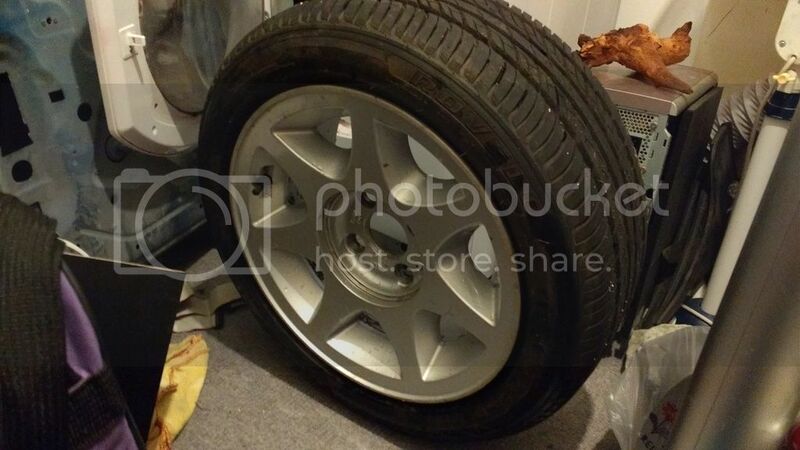 Anyway, eBay ruled in my favour and we are now pursuing them for extra costs, because to even send the tyres back i have to possibly fork out yet another £40 on-top of the £75 i have already forked out to get them unmounted from the rims! The vendor said they would cover up to £60 of that, but only if we took business outside of eBay and jumped through their own hoops, thus stripping me of any protection i have by doing things through eBay. So basically they are trying to blackmail me, and would only do the morally right thing if i surrendered all my rights and protections that shopping on eBay grants me in the first place which is why I do business on that site to begin with! Stay away from mytyres on eBay everyone! Hell i'd stay away from them in general (they have their own site outside of eBay) as they are clearly very shady. I cant wait to leave feedback for them! I ordered a set of 205/50/17 tyres from mytyres.co.uk and have not had a problem with them. A17 LTF wrote: I ordered a set of 205/50/17 tyres from mytyres.co.uk and have not had a problem with them. This is the thing, everyone is top notch when they want your money, as soon as they get it though or you require after care or need to return something thats when issues start to arise as nobody gives a crap at that stage. They've got your money by then. Man, sounds like you've been having as many issues as i have. As always theres conflicting information on the matter and a bunch of little children arguing over who is right and wrong but its worth a look! I'm apprehensive about spending any more money on this problem as i simply cant afford it but theres a garage near me who checks the alignments for free so cant hurt can it? The tyres are definitely defective (as confirmed by the last tyre fitter), but if thats causing a problem, as well as this possible alignment issue on top of that then its no wonder this has been such a massive headache! I spend ages chasing a similar thing on mine.. and to be honest I've never fully got to the bottom of it. Various things along the way have helped, but not completely eliminated it. I've just learnt to live with it and accept that 2/3rds of Capri's do it! Main thing was a buckled set of wheels - had them balanced about 3 times. Finally the last place told me they were f*cked, so bought another set. In the mean time, I replaced the tca's/bushes, rack mounts, etc.. with a minor improvement. When I do the front wheel bearings I might try and find somewhere to machine the hubs to make sure they are as flat as can be and see if that helps..
sarkie83 wrote: I spend ages chasing a similar thing on mine.. and to be honest I've never fully got to the bottom of it. Various things along the way have helped, but not completely eliminated it. I've just learnt to live with it and accept that 2/3rds of Capri's do it! Interesting. What sort of wheels and tyres are you running? All my problems seem to go away if i use the old factory 4-spokes, apart from a very small, and i mean infinitesimally small wobble at lower speeds. All the other symptoms (wobble at high speeds, vibrations etc) seem to go away. That is why im thinking its a case of bad tyres + minor alignment issue. I find it hard to accept that this is just a design quirk and to accept it as "normal", ya know? I see it this way: If these were new cars and they had an inherent flaw that caused them all to wobble they would all be recalled. They'd have a bad reputation for it like they do for the slippy rear end and rusty wings etc. Nah, its gotta be something else, something brought on by wear and tear or defective components. I read that just a bad pot hole can knock your alignment out and that can cause vibrations and wobbles through the steering wheel etc. Have you checked the alignment on yours? Some garages check it for free. Arya, if you still want to try something different on there you would be welcome to pop over to Southend and borrow my 15" 7J 7 spokes with 195x 50 x15" tyres. They look like 280 wheels but were apparently made for the Sierra so come with the spacers and stud extenders which take them to the standard Capri offset. Absolutely wobble free on my car !! Ive changed to 13" pepperpots for originality so will probably be selling the 15" wheels sometime but you are welcome to see what they look like on yours. Not_Anumber wrote: Arya, if you still want to try something different on there you would be welcome to pop over to Southend and borrow my 15" 7J 7 spokes with 195x 50 x15" tyres. Thanks, that's very tempting. How much are you thinking of looking for when you do eventually sell the wheels as I might be interested. That would mean selling the minilights but I could live with that. What day and time would work for you if I came down? Sure I work from home for much of the time so may just have to steer around conference calls and the suchlike during the daytimes. I'll PM with my contact details and we can arrange. 15 inches with 195/50/15 tyres. Immense thanks to Not_Anumber for letting me borrow them to test them on my car (they used to be on his beautiful 2.8). Great meeting you buddy and im eternally grateful! Looking forward to seeing you again. The idea is to see if another set of alloys with a good set of tyres on them still gives me a wobble. Trying to determine if part of the issue im having is due to the wheels themselves, as well as the tyres that are on those wheels. Most of these problems seem to go away if i use my old standard 4-spokes, but want to see if i can replicate the problem with an entirely different set of wheels and tyres. If i can, then obviously its a problem with the steering alignment, combined with the defective tyres i have on my other alloys. This way we can determine for certain (finally) what is going on and what i need to do to fix it. If i put these wheels on and there are no problems at all, im thinking of buying them and selling my Superlights. 15" rims are a better choice for future proofing the car anyhow, since tyre choices are far more plentiful (and affordable) than the very limited options for 205/60's.